Working in a seabird conservation project is something that I would never have imagined the first time I stepped on to the Maltese islands. When I was first a volunteer in the conservation team, working against the illegal trapping and hunting problem in Malta, I had the good luck to meet someone who would help me to discover the amazing group of birds that are the shearwaters; Benjamin Metzger is his name. I still remember my first contact with these seabirds, back when I was a volunteer one night in March two years ago. I remember the red torch lights above our heads, reflecting over the rock on the dark cliff, the rope touching the natural wall and climbing to reach one cave in the middle of the towering cliff. I remember the fear and astonishment of this moment and it was here that I could see these seabirds for the first time, nestled in the same burrow they come back to every year to meet with the same partner during the night. Their dark eyes were looking at the horizon from where they come almost every night during the breeding season. I admired their elegant wings with which they fly hundreds of kilometres to come back to Malta every year and the strong beaks they use to fish at sea. When we were coming back I could see the open night sky, full of stars, and I knew that I wanted to work in this field. Now I am in my second year working as a warden in the LIFE Arċipelagu Garnija project, focusing on the Yelkouan Shearwater. I have developed a good idea of the situation surrounding the Yelkouan Shearwaters in the Maltese Islands and what threatens their conservation: rat predation, light pollution, disturbance from boats, and fishery by-catch stand out. 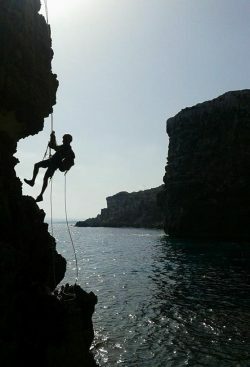 All actions that I participated in are necessary for the conservation of this species and their future in Malta including monitoring colonies by abseiling long cliffs or with the project RIB, tracing the problems close to the colonies, and using modern technologies like a thermal imaging camera and drone to make the study easier. Not forgetting awareness activities for the public to encourage local people to get involved, which might be the most important action to improve the situation of the Yelkouan Shearwater in Malta. Conservation is impossible without the support of the local people. All these actions are vital to achieve to the main goal: a sustainable future for this species in Malta and in the Mediterranean. My impression and feeling about seabirds changed my mind and perspective of conservation around the world. Everything is connected and we can’t improve conservation without considering all of the factors together; people, climate change, ecology, funds, and partners. The most important point is to have a good team to work in the same direction. And thanks to this project I’ve met incredible people and learned so much from all of them, and I hope to continue learning from them and about seabirds to further help this magnificent group of animals. I can’t imagine a future for humans if we don’t preserve all biodiversity on this planet and seabirds are a key group for healthy ecosystems. Birdlife Malta has given me a unique opportunity and experience. Now, I can look at the horizon with optimism, seeing that birds fly free, but knowing that still there is so much work to do.